Editor’s note: This monthly column explores ideas, insights and discoveries made in New Jersey that are shaping our future. It’s vital to keep moving forward, except when you are ready to fall off a cliff. It’s at times like this that you may want to consider taking a step back and consider a different route. According to two Somerset County residents, America is headed for a devastating fall due to the ever-widening gap between the rich and poor and they have devised a plan to revitalize the American economy — specifically addressing the flat-lining economy of the middle class. The duo who hail from both sides of the aisle offer a plan to avoid what they perceive to be a disastrous cliff in their new book: “The 3rd Way: Building Inclusive Capitalism Through Employee Ownership.” According to its authors, the book is based on the idea that capitalism works but is not fair. Socialism is fair in theory but does not work. 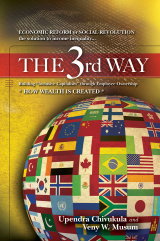 They conclude, there is a third way. “We are indeed on the brink of disaster and what we are doing now is not working. While some of the presidential candidates recognize the growing income inequality in this country, no one has yet to come up with a specific plan to help the middle class regain economic stability,” said Veny Musum, a resident of the Basking Ridge section of Bernards, self-identified Republican and former senior vice president of Paul Mitchell Systems in Beverly Hills. Musum teamed with Upendra Chivukula, a resident of Franklin and self-identified Democrat nominated by Gov. Chris Christie as a commissioner to the N.J. Board of Public Utilities on Sept. 18, 2014, and confirmed by the Senate on Sept. 22, 2014. Prior to this role as commissioner, Chivukula served as the deputy speaker of the New Jersey Assembly, and represented the 17th Legislative District. While rooted in dueling political parties, Chivukula and Musum agree that the number one problem plaguing America is the loss of economic opportunity for members of the middle-class who no longer have a way to amass real wealth and enjoy a sense of economic stability. Musum and Chivukula agree that while there were a few things that our Founding Fathers didn’t get right, we need to revive three of their central principles. “They believed in low taxes, limited government and broad-based property ownership. Most conservatives have forgotten the last one, and without the last one, it is impossible to sustain the other two,” Musum said. The two businessmen believe the answer to solving income inequality is to move beyond the two ways that have thus far failed: self-centered capitalism and government redistribution. 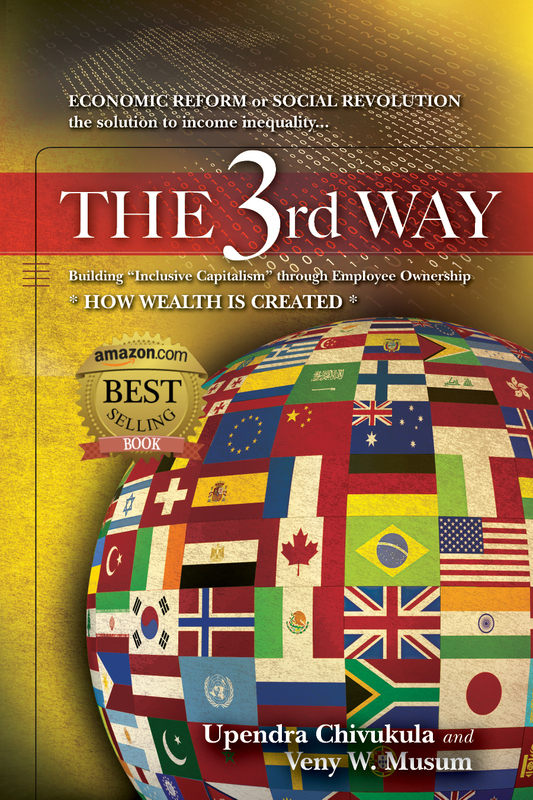 In their book, “The 3rd Way,” they outline a plan for what they call “inclusive capitalism” that they believe will lead to economic democracy. According to Chivukula, the plan involves creating incentives for businesses to offer profit sharing programs to their employees that in turn will make it possible for employees to amass wealth as the company they work for continues to grow. Musum said there are 10,000 companies in America operating on this model that is producing highly desired results for individuals, business and society. “Corporations who share the wealth attract highly motivated and productive employees. Government and taxpayers win because the cost of social programs and unemployment is reduced and, ultimately, it will provide a boost to the entire economy,” Musum said. Chivukula pointed out that profit sharing has proved enormously successful for companies such as Microsoft, Apple, Google, Procter & Gamble, General Motors, UPS, Amazon, Publix Supermarkets, Exxon/Mobil, Bloomberg and Southwest Airlines. Chivukula and Musum agree that everyone wins when workers share in the wealth through capital equity and stock. “Today our wage-only labor force is generally disconnected from wealth producing, technology driven capital. And our political and economic systems have not kept pace with technological change,” Musum said. While Chivukula and Musum do not believe that the government should have its hand in rearranging the economic structure of the country, they do believe that tax cuts to business would be the way to create an incentive for companies to share the wealth. “But we are not talking trickle-down economics, we are talking about offering tax incentives with a very specific expectation that businesses would create robust profit-sharing programs for their employees,” Musum said.